With the new year underway, we have already had 5 days to tackle those New Year's resolutions. Just like most people's resolutions, mine this year (and every other year for the past ten years for that matter) is to work out more to get fit and eat healthy with a steady diet. Costco is there to help you get started on that 2015 New year's resolution of yours by offering you a 2 year all club sport membership to 24 Hour Fitness, so that you don't have any excuse not to work out. 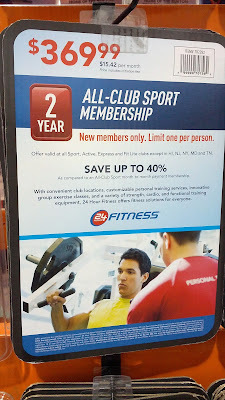 If you're looking for a gym with newer equipment, towel service, cleaner locker rooms, etc., then you'll want the 24 Hour Fitness All Club Super Sport Membership instead. Hopefully, 24 Hour Fitness can help you not repeat the same New Year's resolution for 2016, but if going to the gym isn't for you, then consider getting one of them cool Fitbits. With over 300 locations, there are more locations than Planet Fitness and Crunch Fitness and it's now convenient to hit the gym. Whether you're into lifting some weights, doing some cardio on an elliptical, taking classes, or taking advantage of the personal trainers, you'll easily find a 24 Hour Fitness Sport Club near you. You can go to the gym first thing in the morning or go right after work, and your local 24 Hour Fitness will always be open. That and you'll always find a location near your home, work, or when you travel. Offer valid at all Sport, Active, Express and Fit Lite clubs except in HI, NJ, NY, MD, and TN. Save up to 40% as compared to an All-Club Sport month-to-month payment membership. Burn calories and build muscle with the most advanced equipment. Find your inspiration and push your limits with free group exercise classes that move you. Maximize your workouts and reach your goals faster with certified personal trainers.